Proven, proprietary, severe-duty technology. Custom built for Pierce chassis. The TAK-4 Independent Suspension system maintains the feel of the road with outstanding steer-ability and a dramatically smoother ride over any surface. A tight steering system, torsion bar independent suspension, and high-performance braking maximize control. It makes a 12-ton fire apparatus feel like an SUV. TAK-4 was originally engineered and developed by Pierce’s parent company, Oshkosh Corporation, for military and aircraft rescue vehicles facing off-road duty. TAK-4 deals just as effectively with more mundane road events like pot holes, railroad tracks, speed bumps and crowned intersections. In 2001, Pierce changed the industry by introducing TAK-4 Independent Front Suspension (IFS), engineered specifically for Pierce vehicles. Pierce now offers TAK-4 Independent Rear Suspension (IRS) which applies the same military grade performance to the rear for supreme ride performance. For maximum mobility, Pierce also delivers TAK-4 T3™ system, which combines the advantages of TAK-4 IRS with a 100 percent mechanical rear steering system. 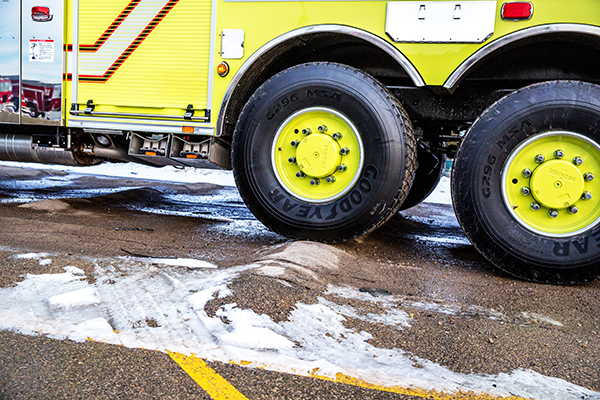 Up to 10" Up to 10"
The TAK-4 design not only maximizes a truck’s performance, it minimizes the wear and tear on your equipment and streamlines the maintenance process. There are no u-bolts on the front axle, no adjustments needed for the caster angle, and no need for lubricating the heavy-duty ball joints. Your rig spends less time in the shop and more time on the street. With a vast service network, Pierce provides you with trained certified technicians to perform routine maintenance and inspections that keep your vehicle running at its peak. Pierce partnered with the Transportation Research Center of East Liberty, OH to subject TAK-4 to the roadway works – chatter bumps, staggered bumps, high-crown intersections, ruts, and potholes. A 24,000-lb load was placed on the front axle to extreme-test the suspension, steering, and braking systems. To gauge endurance, the vehicle then performed 17,700 actual test miles. Based on our testing, the TAK-4 IFS was proven to outperform any other suspension system in existence in the most grueling conditions.